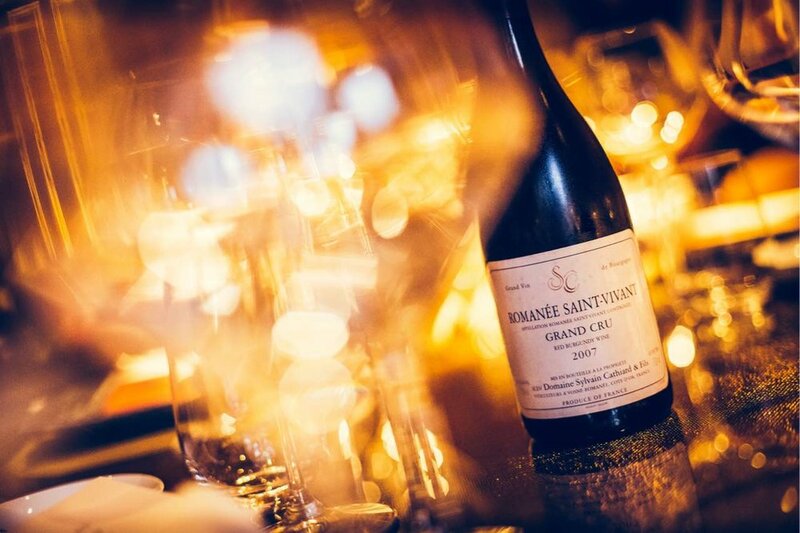 Last Thursday I had the privilege of hosting a wine dinner at Épure featuring wines from Domaine Sylvain Cathiard et Fils, arguably one of the most in demand guys right in all of Burgundy. The theme this time we chose to focus on the different wine making techniques from vintages created by the father Sylvain (pre-2011) and the son Sebastien (2012 onwards). The transition was rather smooth, with Sebastien joining the domaine for a few years prior to taking full control in 2011. The changes are subtle - Sebastien has kept up with the meticulous care of the old vines to standards started by his grandfather however he varies greatly in the use of oak. Choosing to use less new oak than his predecessor, the wines become more pure in fruit with greater focus on terroir. At the same time, he is much more ambitious in using the best oak possible, often bidding top dollar in auctions for wood from the best forests in France and one of the very few who blind tastes samples from different barrels of various producers. The results are evident and the domaine has since been regarded as one of the best producers in Vosne-Romanée now. All of the wines were generally very good. The NSG 1er Cru Murgers was a delightful opener - bright yet lush at the same time and a good wine to ease into the evening with. Suchots was also quite beautiful as well, as it opened up most majestically. There is weight, oomph and pizzazz from a lieu-dit that can be disappointing with its variance due to its size (largest 1er cru in Vosne-Romanee). His parcels are located closer to Echezeaux to the edge and in the middle where there is a dip. The Malconsorts is considered the flagship wine of the domaine, located in a prime steep slope sandwiched between Hudelot-Noellat and De Montille, slightly higher and diagonally opposite DRC's La Tache. I expected a lot from the Malconsorts and indeed most people were quite excited by it, I still thought it left something to be desired from such a great region. I suspect it's the age of the wines and time it need to open so I have my own personal conclusion still open and hope to revisit in due time. The RSV was a complete stunner in both vintage but the 2007 just had all the time it need to bloom and grow in your mouth. On the nose you expected something more but it was complex, juicy, elegant all at the same time and quite possibly one of the best juice I've tasted this year. The winning wines of the night as we took a vote, a tie between RSV 2007 (made by the father) and Malconsorts 2012 (by the son). So there is no final verdict in which whether Sebastien was truly better than Sylvain, even though it was unfair competition. This more for fun than anything else, ultimately there are so many variables at stake here regardless of the producer himself - the age of the wine in the bottle, the vintage itself, the condition of the bottles - there is no real way to hold these things equal ceteris paribus. Still an amazing learning and tasting experience that I will truly treasure and yes I finally GET why Cathiard is so hyped right now. May his star continue to shine brightly going forward.